Read roznama Rehbar from Gilgit Baltistan. Rehbar Gilgit is 1st independent Online Urdu language Newspaper of Gilgit Baltistan Pakistan. Daily Rehbar Gilgit is now printed in Gilgit and Published from Gilgit City. Rehbar Gilgit is also known as Rahbargb. 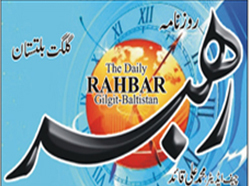 Daily Rehbar is an Urdu daily newspaper online from Pakistan. It covers and highlights news on politics, business, education, sports and entertainment etc. The Pakistan newspaper covers all local and national and international news. It is based in Gilgit Baltistan, Pakistan.